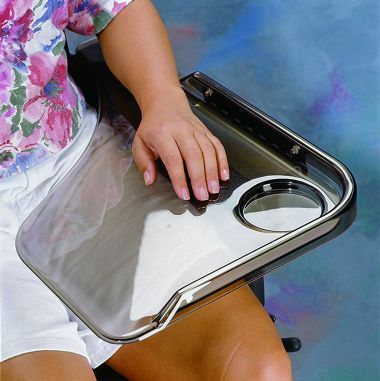 Wheelchair Tray - Flip Away Scratch Resistant Plastic. Designed for active functional lifestyles these wheelchair trays lift up and out of the way during transfers or for wheelchair storage. 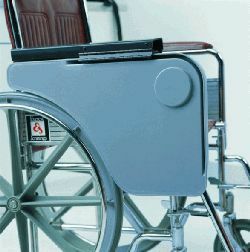 Can be fastened to either a full-length or desk style upholstered wheelchair arm. Measures 330 x 530mm (13 x 21") with a moulded rim and recessed area for a cup or glass. Translucent scratch-resistant plastic allows user to view lower extremities for safety.